This page Economic inequality is part of the politics series. Economic inequality refers to disparities in the distribution of economic assets and income. The term typically refers to inequality among individuals and groups within a society, but can also refer to inequality among nations. Economic Inequality generally refers to equality of outcome, and is related to the idea of equality of opportunity. It is a contested issue whether economic inequality is a positive or negative phenomenon, both on utilitarian and moral grounds. Economic inequality has existed in a wide range of societies and historical periods; its nature, cause and importance are open to broad debate. 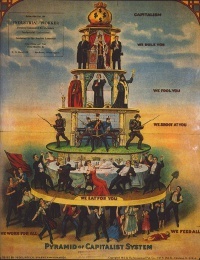 A country's economic structure or system (for example, capitalism or socialism), ongoing or past wars, and differences in individuals' abilities to create wealth are all involved in the creation of economic inequality. There are various Numerical indexes for measuring economic inequality. Inequality is most often measured using the Gini coefficient, but there are also many other methods. Unless indicated otherwise, the text in this article is either based on Wikipedia article "Economic inequality" or another language Wikipedia page thereof used under the terms of the GNU Free Documentation License; or on original research by Jahsonic and friends. See Art and Popular Culture's copyright notice. This page was last modified 15:44, 25 June 2018.